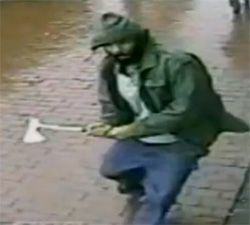 Zale Thompson of Queens, New York attacked four recent police academy graduates with a hatchet on the street in Queens yesterday as they were posing for a picture. The incident was caught on tape. One officer was struck in the head and is in critical condition. Another officer was struck in the arm and was treated and released from the hospital. The other two officers shot at Thompson, who died at the scene.